Our lavender room is a small cozy room for 2 persons and is equipped with a double bed, wardrobe, desk / dressing table, TV and shower / WC. Free Wi-Fi throughout the house. Our Nelkenzimmer is equipped with a large double bed, sofa set with sofa and armchairs, TV Linen chest shower separate toilet, hall / cloakroom area. Free Wi-Fi throughout the house available. Our rose room consists of a spacious double bed, large wardrobe, chest of drawers, small seating area, TV, shower / WC. Free Wi-Fi available throughout the house. 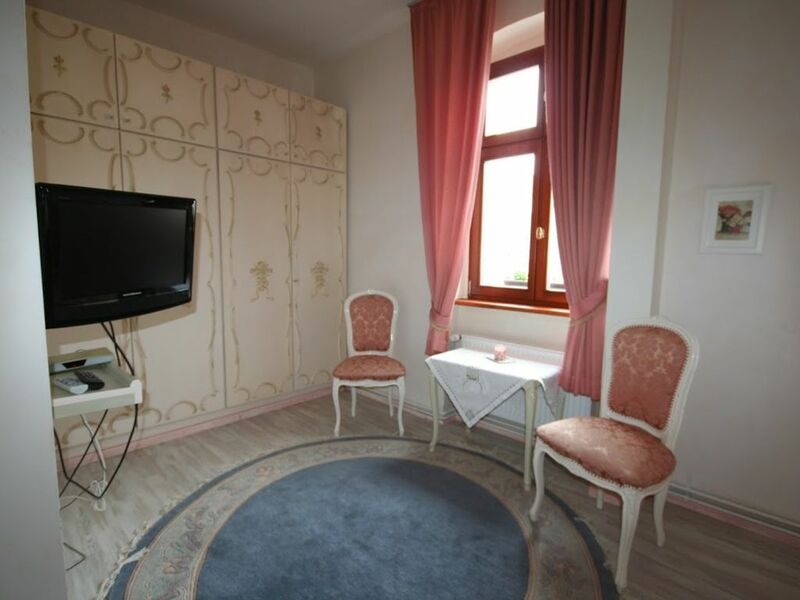 Our Tulpenzimmer consists of a double bed, wardrobe, desk, TV, shower / WC. Free Wi-Fi is available throughout the house. In the main house is a pool billiards for free use, as well as a flat screen TV, library with about 2000 books and various games ready. Washing machine with 9 Kg capacity, softener, washing powder and dryer can be used for a fee of € 3.50 per wash. On the property is the parking lot. Outside there are free outdoor ping pong table, badminton, boules, deck chairs, seating, barbecue, kayak available. On fresh evenings, our fire bowl invites you to a campfire. From the sandy beach it goes directly to swimming in the BaalenseeDas property is located directly on the Baalensee with its own sandy beach and jetty, almost directly in the city center. The city center with good shopping is within 3 minutes walking distance. There are various bakeries, cafes, restaurants, ice cream parlor, post office, Netto black, Netto red, pharmacies, banks, doctors, KiK, Ernsting's family, boutiques, bike rental, marketplace. The train station can be reached in about 6 minutes. Aldi and Edeka are about 1 km away. From us diagonally opposite is the canoe rental Nordlicht. We offer double and single rooms as well as apartments for weekends, short breaks or longer stays. Gladly guests celebrate birthdays, weddings, class reunions with us or simply spend a few relaxing days with good friends with us. The cozy rooms and apartments are all designed differently, no institution is like the other. In our hall you will find about 2000 books to read and plenty of space for nice get-togethers and due to the size-ca. 110 m2- also for dance activities, a music system is available. There is also a billiard room for our visitors, which is often used. Families with children are very welcome, on request baby travel beds and high chairs are available. Dogs are not allowed in the apartments. In our Mediterranean garden our table tennis table can be used, our in-house canoe is ready for test drives and will be charged for a small fee. A washer and dryer are available for a fee. We hope that we have managed to revive a little of the past beauty of our house. Visit us once, then you can get a picture of yourself.